Matthias Gstoehl joined LALIVE in 2017. He specialises in complex, often multi-jurisdictional, proceedings, including asset recovery, fraud and white collar crime, recognition and enforcement of foreign judgments and awards, international mutual assistance, FINMA enforcement proceedings and bank insolvency. Matthias Gstoehl’s activity strongly focuses on banking and finance disputes. With first-hand experience in the financial sector, he handles complex cases requiring specialist knowledge in derivative instruments, hedge funds and other financial products. He also regularly acts for clients in contentious corporate, commercial and private client matters (primarily successions and trusts). Matthias Gstoehl is a member of the Zurich Bar Association (ZAV), the Swiss Bar Association (SAV), the International Bar Association (IBA), the Swiss Arbitration Association (ASA), the International Association of Young Lawyers (AIJA) and the International Association of Restructuring, Insolvency & Bankruptcy Professionals (INSOL). He is a frequent speaker and moderator at international conferences. 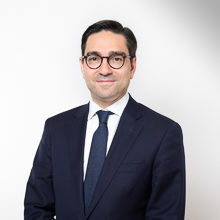 Before joining LALIVE, Matthias Gstoehl was a partner at Nater Dallafior (2012 – 2017), worked in derivatives structuring at two leading investment banks in London and Zurich (2006 – 2012), as an associate for Bär & Karrer in Zurich (2001 – 2005) and as a trainee for Froriep in Geneva (1998 – 2000). Matthias Gstoehl studied law at the Universities of Vienna and Geneva (lic.iur, 1998), and completed postgraduate studies in Finance at London Business School (MSc in Finance, 2006). In: Rudolf Tschäni (Ed. ), Mergers & Acquisition VI - Europa Institut Zürich, Vol. 48, Zurich 2004, pp. 33 ff. Zeitschrift für Europarecht, internationales Privatrecht und Rechtsvergleichung (ZfRV), Wien 1998, pp. 1 ff. Stockholm 17/06/2017 Matthias Gstoehl Speaker: Annulment of Awards on grounds of public policy – a review of the merits through the back door? Stockholm 17/05/2017 Matthias Gstoehl Speaker: Annulment of Awards on grounds of public policy – a review of the merits through the back door? London 04/09/2015 Matthias Gstoehl Speaker: State Court Participation in Arbitration – Help or Hindrance?